As the terrifying technological tentacles immerse themselves seamlessly into the city's routines the Gear under goes a subliminal yet catastrophic evolution. Every thought, every action, even every location of every citizen is recorded onto the alien's consciousness. Not a single aberrant gesture goes unmarked under the scrutinizing control of the extraterrestrials. Sitting in the middle of the madness is a tiny lonely street artist. Perched under a tree in the middle of the busy downtown walkways this weird looking little bald man scribbles away day after day armed with nothing but patience and a portable radio. Although the ghetto blaster is of the same basic lineage as the technological parasites, the fact that it is played outwardly for all to hear differentiates it's effect from the terminal fusion of the ear wires or hand screens. As the music plays from his seance-box weird spirits of days gone by are recalled to the artists side. This time it is Frank Zappa. 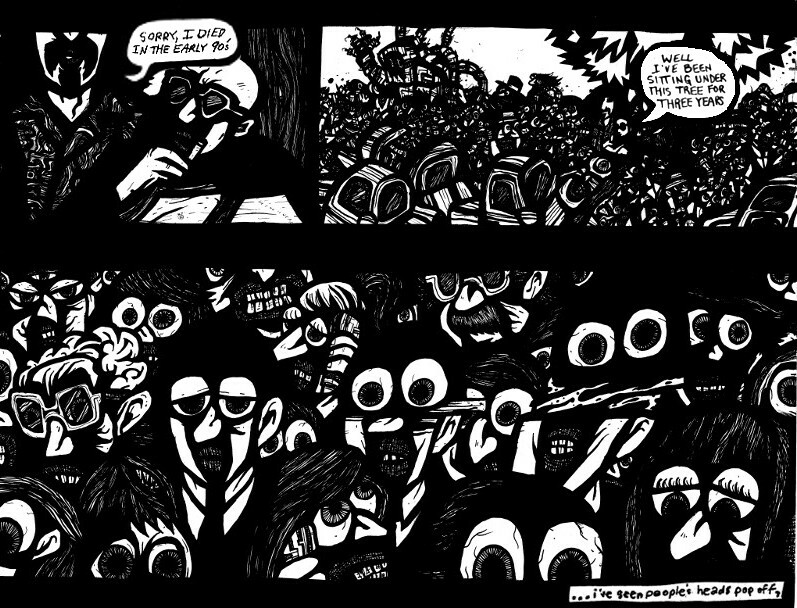 Perplexed by the situation the musician's ghost speaks up questioning the state of the electronic invasion. The artist, probably long since half crazy from sitting in the streets, answers the ghost and begins to share the terrors he has witnessed. HEY APATHY! Free Webcomics Book 1 is a story about a parasitic electronic evolution and the insignificant superhero that tries to stop it. 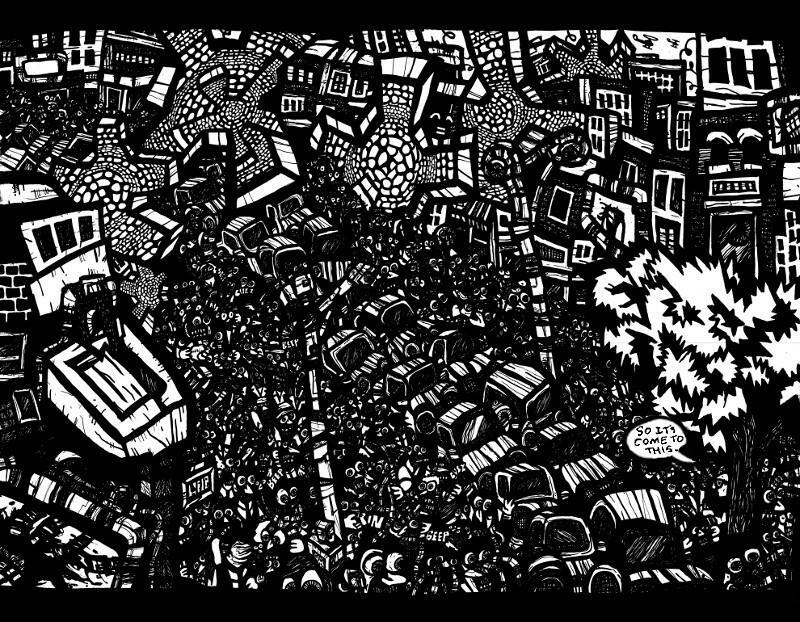 I drew the book from my perspective as a street artist. At that time I actually was sitting under a tree in the downtown core telling stories and drawing pictures as a full time busker. One of my favourite things to do during those days was to blast crazy music out unto the crowds. I'd play deep dub-reggae mixes, experimental Jazz like Coltrane and late Miles and a lot of Zappa. It was an aggressive contrast to the popular music coming from all the commercial storefronts around me. My strange selections attracted tonnes of inquirers as well as many like minded listeners and played a huge part in the ambiance I created during my painting performances. I wanted to include some aspects of this in my comics and came up with the idea of the radio as a seance machine. The idea was to introduce each new story from under the tree out on Queen Street and have the ghosts of the musicians show up to give the reader a clue as to a possible accompanying sound track.